Choking or Foreign Body Airway Obstruction occurs when food or some other foreign object occludes the airway and prevents air from moving in and out. Generally the obstruction will become lodged in the opening of the trachea and not inside the trachea. Foreign Body Airway Obstruction can be broken down into 3 categories. These are: Complete airway obstruction, partial airway obstruction with poor air exchange and partial airway obstruction with good air exchange. Partial – Good Air Exchange: Victim can speak Let victim relieve obstruction on his or her own. Partial – Poor Air Exchange: Victim can’t speak, very little air moving. Cough is silent and ineffective. Victim requires assistance. Complete Obstruction: Victim can’t speak, no air moving. Victim can’t cough. Victim requires assistance. The Heimlich Maneuver relieves the obstruction by taking residual air from the victim’s lungs and forcing it out. This is similar to taking an empty soda bottle, placing a cork in the opening and smashing the sides of the bottle. The force of the air in the bottle will send the cork flying just like the force of the residual air in a victim’s lungs will send the obstruction soaring. If you see someone giving the universal sign for choking or you suspect that he or she is choking, do the following. Ask the victim, “are you choking?” If they acknowledge that they are, then ask them, “can you speak?” If they cannot speak the obstruction will need to be relieved. You now need to get permission to help the victim. Tell the victim, “I’ve been trained, I’m going to help you.” If the victim refuses your help, you must back off. If the victim becomes unconscious, then it is implied consent. Get behind the victim, place one leg between the victim’s legs and take a wide stance. Wrap your arms around the victim’s abdomen. With one hand, make a fist. Place it just above the victim’s navel with your knuckles facing up. With the other hand, grab your fist and thrust inward and upward. The obstruction should come out within the fist few thrusts. Look to see if the obstruction is relieved after every 5 thrusts. Continue these abdominal thrusts until the obstruction is relieved or the victim becomes unconscious. 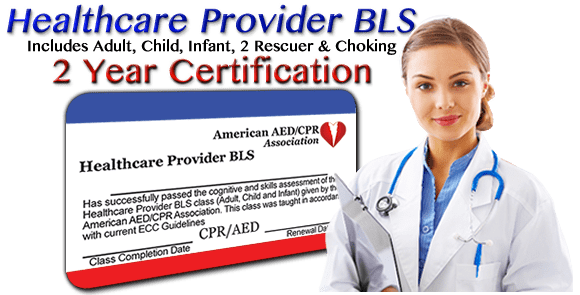 When a conscious choking victim becomes unconscious begin CPR immediately. If you’re not alone, send someone to activate EMS. Healthcare Providers should perform 2 minutes of CPR before leaving the victim to activate EMS. The first thing you should do to the victim is the “Tongue Jaw Lift”. With your index finger under the victim’s chin, place your thumb in the victim’s mouth just far enough to grab the jaw and lift it up. This will allow you to see into the victim’s mouth and perhaps see the obstruction. If you see an object, remove it. NEVER DO A BLIND FINGER SWEEP ON A CHILD OR INFANT. Then attempt to open the victim’s airway with the Head Tilt Chin Lift and give a breath. If it doesn’t go in, reposition the head and give another breath. If that does not go in, continue CPR for another 2 minutes. Infants will not know be able to tell us that they are choking. When an infant is choking, he or she will kick, thrash and try to scream. No sound will come out and they will quickly become cyanotic (bluish discoloration of the skin). We cannot do the Heimlich Maneuver on an infant. Pick up the infant and turn him or her upside down. While resting your arm against your leg as shown in the illustration, hold the victim face down. Give 5 back blows between the shoulder blades of the victim. Then flip the victim over and give 5 chest thrusts by compressing in the same place we did compressions during CPR. Continue to give 5 back blows followed by 5 chest thrusts until the obstruction is relieved or the victim becomes unconscious. 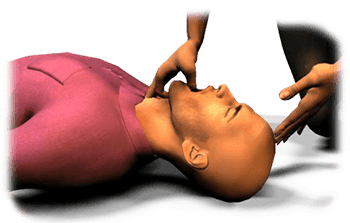 When a conscious choking victim becomes unconscious begin CPR immediately. If you’re not alone, send someone to activate EMS. Healthcare Providers should perform 2 minutes of CPR before leaving the victim to activate EMS. During ventilations, open the victim’s mouth to check for foreign objects and obstructions. If you see an object, remove it. Studies have shown the chest compressions are more effective than abdominal thrusts to dislodge a foreign object from an obstructed airway. NEVER DO A BLIND FINGER SWEEP ON A CHILD OR INFANT. Continue CPR until EMS arrives or the victim is responsive. Remove object if you see it.